All our tapestries are sourced from Belgium, French and Italian weaving mills. Each piece is unique and hand finished with care and skill. We do not source mass produced reproductions which are mainly fabricated in Mexico, China or the USA. Each wall hanging tapestry is woven individually and presented hand finished, lined and with a rod pocket ready to take a tapestry hanging rod. Tapestries are woven using one of the following three techniques; a reference in the text with each image identifies the technique used to create that tapestry. These tapestries are woven on Jacquard looms, which use perforated cards depicting the design, the loom is warped up, and then the weft thread of many different colours passes over and under the warp to create the design. The management of the loom is a skilled craft requiring patience and great attention to detail. These looms are named after the French weaver Joseph M. Jacquard. (1787-1834). This method requires each colour in the design to be applied individually onto the woven fabric creating subtle shading and an aged appearance to the tapestry. 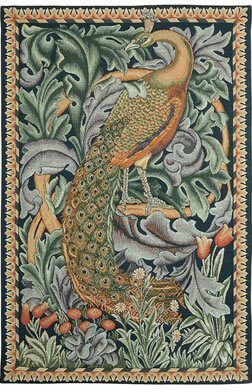 As the name suggests these tapestries are woven by hand as the original works of art were. Woven mainly in wool by highly skilled craftsmen, each tapestry takes months to finish and would be regarded as an heirloom to be passed down through the family for generations of enjoyment. Sizes are given as close to actual as possible and stated in centimeters as length (height) x width Many tapestries are available in several different sizes. Wall hanging rods are available in two styles and six sizes, ranging in width from 35cm up to 300cm. The rods are expandable and are flush mounting, allowing the tapestry to hang. Tapestry hanging rod finials are cast by hand in solid brass at 1200°C then 'antiqued' to give an authentic aged appearance. These rods are fixed directly to the wall through the eyelet on the finial using the screws and plugs provided. The largest size hanging rods are supplied with an obscure flush fixing central bracket for additional support. Please refer to the Tapestry Hanging Rods listing for all specifications and ordering. Some tapestries in particular sizes are available with Hanging Loops. Please enquire whether your chosen tapestry is available with Hanging Loops if you require these, an additional charge will apply. Those tapestries pictured on the website with loops are also available without loops if required. The wall hanging tapestries are arranged in categories by style and period, for ease of browsing and selection. Each tapestry has been given a title and a unique alpha/numeric code to ensure accurate identification. Clicking on MORE DETAILS produces a larger image, rolling your cursor over this image gives you a magnified image of the tapestry to enable you to see fine detail within the design or read script on a tapestry, without having to wait for the image to load. Use the drop down bar to see the sizes the tapestry is available in and relevant prices. We hope you find visiting Classic Tapestries website a user friendly and pleasant experience.